This Hologram is a ‘Bright’ Idea! /This Hologram is a ‘Bright’ Idea! Forget about Lite-Brites, this hologram is bringing 3D printing to light thanks to the idea of light painting, as pictured above from Engadget.com! 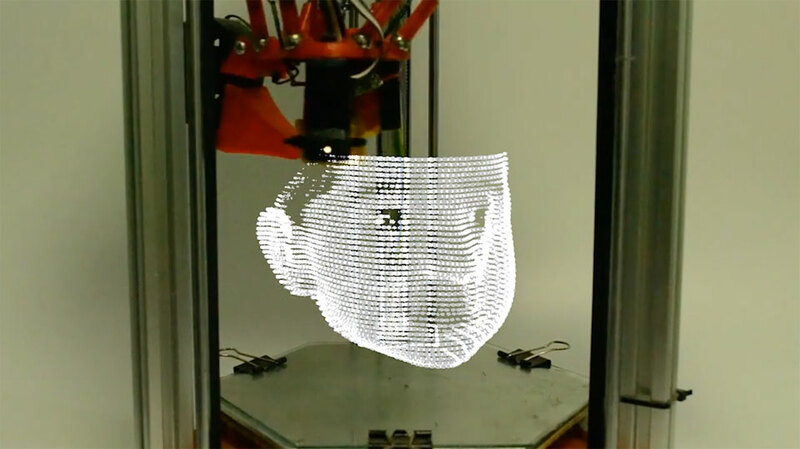 So far, we’ve seen 3D printing create some amazing tangible objects. However, artist Ekaggrat Singh Kalsi wanted to take this innovation to a whole new level, so he came up with a “bright” idea. Thanks to a modified 3D printer, Kalsi has been able to create art, namely floating color portraits. As with any new idea, Kalsi had to refine his approach. Initially, he began this hologram-making process by using a NIKON D3100, which focused on long exposure photography. However, he grew increasingly displeased with its confines of still imagery. In fact, these shots didn’t even include the full color spectrum. So, Kalsi found a Better Way to make a hologram. Over time, he refined the process, which ultimately has allowed him to print in full color. Kalsi uses a new camera that automatically starts and stops, which is of benefit for the creative process. He also has attached an RGB LED bulb to the working end of the 3D printer that’s used to build a light-based structure. A printer also was programmed to precisely control the movement of the LED and turn the light source on and off when necessary. Essentially, Kalsi’s system “prints” a 3D-printed object line-by-line. As we mentioned before, a modified 3D printer is used, however a bright light is applied at regular stages of the process to illuminate the work. While in progress, the human eye is not able to see the hologram. It’s the end video that shows the hologram. His featured artwork is actually of his daughter’s face. Kalsi used a 3D scan to capture his daughter’s face, which was then communicated to his printer, in order to create the hologram. It’s interesting to point out, however, that this isn’t the first time that hologram-making technology has been developed. In fact, students from Carnegie Mellon University (which is in Pittsburgh, too!) created a large robotic arm that could do the same thing. Though Kalsi’s 3D printer is much more home-friendly, he has also improved, as we mentioned before, his preexisting designs to create full-color images. Airbus is ‘Channel’ing Innovation with this Prototype →	← Prandtl-m is Soaring to New Heights! Thanksgiving Day Decorations that are in Another Dimension! Ripples Makes 3D-printed Coffee: Let that Invention Percolate!